Forgiveness does not mean ignoring what has been done or putting a false label on an evil act. It means, rather, that the evil act no longer remains as a barrier to the relationship. Forgiveness is a catalyst creating the atmosphere necessary for a fresh start and a new beginning. It is the lifting of a burden or the canceling of a debt. The words "I will forgive you, but I'll never forget what you've done" never explain the real nature of forgiveness. Certainly one can never forget, if that means erasing it totally from his mind. But when we forgive, we forget in the sense that the evil deed is no longer a mental block impeding a new relationship. Likewise, we can never say, "I will forgive you, but I won't have anything further to do with you." Forgiveness means reconciliation, a coming together again. today's quote is drawn from a sermon martin delivered on christmas day 1957. he wrote the sermon while in jail for civil disobedience during the montgomery bus boycott. the entire sermon is powerful and transformative, it was difficult choosing a passage to use today. today's photo is jim dine's monumental sculpture cleveland venus which graces the front of the carl b. stokes federal courthouse. by the way, inscribed below the sculpture is a quote by martin luther king jr. injustice anywhere is a threat to justice everywhere. one of the greatest rock songs of all time! led zeppelin's 1971 classic stairway to heaven. Fantastic MLK quote! Damn that guy was so tuned in to the highest possible vibration, wasn't he? 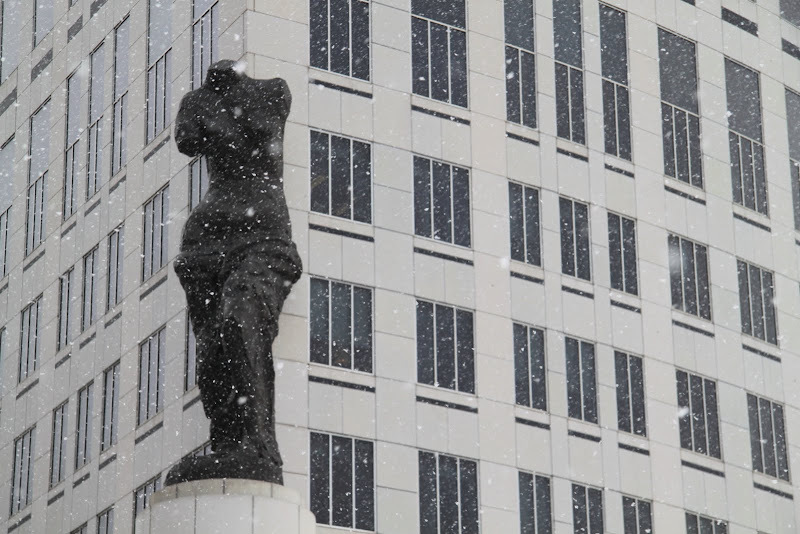 Love the statue in the snow and ... Stairway to Heaven?? OH YEAH!! And he wasn't even 30 when he wrote that. This is a good day for centering. Indeed, amen. And doesn't the flurry of snow somehow add to the image. I love that sermon. thank you. Beautiful, beautiful words from a great man. Timely words for troubled times. I only wish more people would take heed of them. words, example, leadership needed now more than ever. Thanks mouse. Very wise words. If only we would live them! MLK was a hero to me as a little kid...Love this post! I love your blog format. Unfortunately, Stairway to Heaven reminds me of junior high school dances where nobody ever asked me to slow dance on the closing number...which was ALWAYS Stairway to Heaven.